We never did see what color our day was! Looking back down the volcano – from the cable car. You can see the white bus we rode as it traverses a gravelly path. 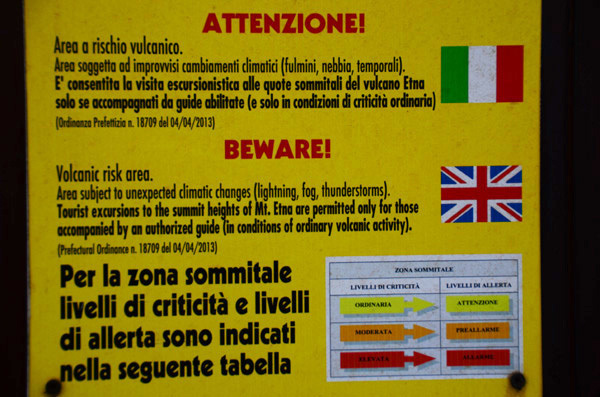 Do or die, today is the day we tackle Mount Etna. 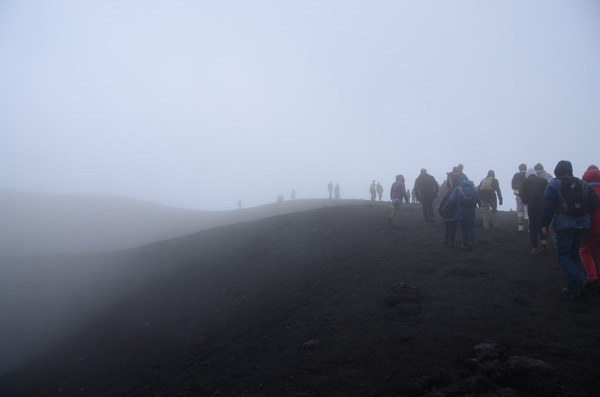 However, after yesterday’s trip around the volcano we are not as desperate to get a good look at it, and particularly not desperate enough to take a 5 hour hike up near the summit. We had actually cancelled those plans when we returned last night. 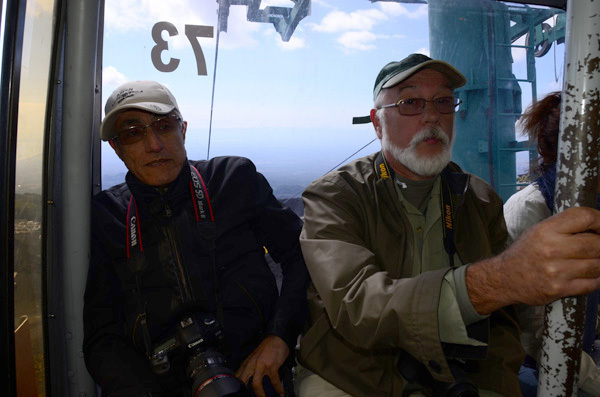 Instead we decided to drive up there and see what we could see on our own. The drive from Taormina, up to the Refugio Nord was a good hour and a half, a third of which was on the autostrada and the rest on winding country roads. The windy (read either way it still applies!) roads were well maintained and took us into alpine forest cover, filled with yellow flowering bushes that reminded us of mimosas. 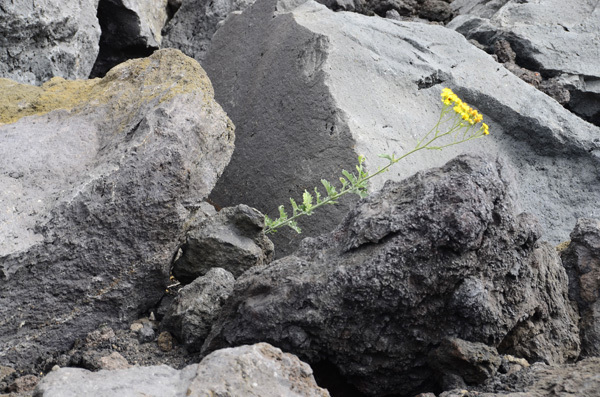 Lots of other wildflowers were blooming too, and it was fun to see little patches of purple and yellow mixed in the black and grey lava rocks, growing bravely from the volcanic ash. Naturally the higher we got, the smaller became the vegetation samples until great swathes around us were nothing but lava. Life clinging to the lava rocks. Once at the top, we were offered hiking shoes and warm coats – available for rent for just two euros. Wisely (though we didn’t realize just how much at the time) we chose to rent the coats. We boarded a bus and were driven out on to the volcano somewhere. 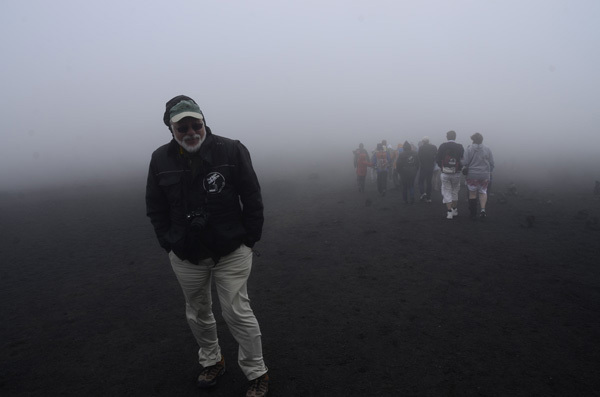 I really can’t tell you where we went or how far it was…the wind was blowing fiercely and there were clouds, steam and ash swirling around us, obscuring the view of anything that was more than 10 feet from our bus. Amazingly there were lots of people walking up there! Some people cannot hold a smile for two clicks of the camera. No one was sick on the ride, despite the facial expressions! When the bus let us off to start walking, we really snuggled down into our warm coats. The wind was howling, and my eyes were watering from the cold. I had on my hiking shoes, and even so, the going was slippery as the scree of ash and rock was difficult to negotiate without slipping. I had the hood of the coat pulled up over my head. My glasses were scant protection against the blowing ash, and for a good portion of the walk we turned our backs to the wind. We were taken to places such as “the crater that opened in 2002”, the “steaming lava from 2012” etc., but honestly we could see so little and were so mentally involved in dealing with the wind and the cold, that they could have told us we were standing in an erupting cone itself and it probably would have registered no more. All our thoughts were turned to getting back on the bus and out of the wind. Gerry poses for me near the steam…You can see how strong the wind is by looking at his khaki pants! 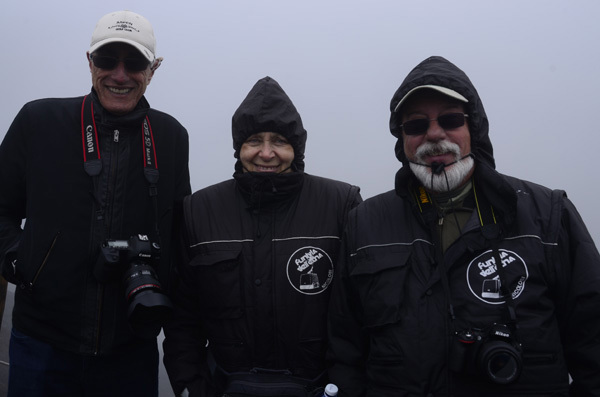 Jon, Galina and Gerry Bundled against the cold. Once we did, I made the mistake of trying to rub my eyes, and only managed to anger the skin around them as I ground the ash in. Still, I would do it again! In a heartbeat! By the time we made the trip back down in the cable car, most of the tourists buses had left, and the crowds were noticeably thinned. Make a note: Whenever you’re in a popular tourist destination, try to visit things in the afternoon when the crowds are gone! We had a pizza lunch at the Refugio level, before shedding our warm clothes and driving back to Taormina. Pretty much the standard view at the top. Today we cannot dally on the way back as we would all want to rest before our dinner invitation tonight. We have been invited to dine at the home of the owner of our hotel! The dinner was one of the most wonderful experiences of our Sicily trip. Imagine how fortunate we feel to have started and ended this adventure with personal experiences in the homes of wonderful Sicilian families. If you have been following this blog, you know that our trip began with a cooking class with Nicoletta Polo Lanza, the duchess of Montechiaro in her home in Palermo. Tonight, we were invited to have dinner with the owner of our hotel, Rosaria Quartucci in her home with her family. 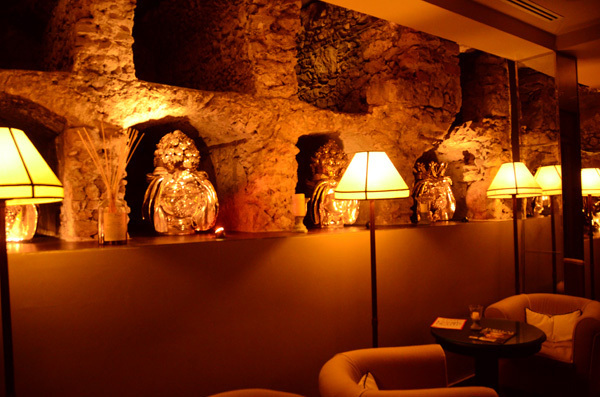 The catacombs inside Villa Carlota, the sister hotel to Villa Ducale. The evening began at Hotel Villa Carlota, another property owned by the Quartuccis. 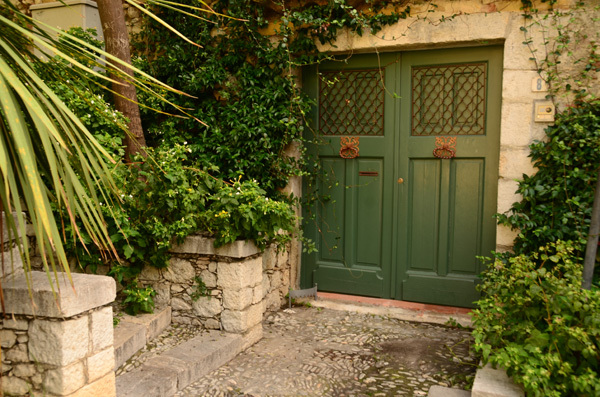 Though similar in feeling to our Villa Ducale, the decoration is different, and the hotel is slightly bigger, boasting more rooms as well as a swimming pool and garden. Rosaria met us at there and gave us a tour. 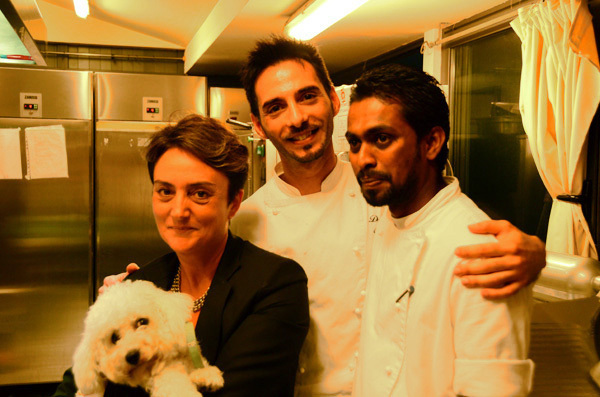 We met David, the chef and his team in the kitchen. They prepared hors d’oeuvres for us that were divine, including roasted fennel, eggplant and zucchini, as well as tuna stuffed with mint and drizzled with chocolate. (That was superb!) And we got to sip prosecco and talk of this and that, getting to know Rosaria, and she us, better. Unfortunately Gerry could not join us. He had been a bit under the weather all day, and decided that sleep was the cure he needed. After our brief sojourn in Villa Carlotta, we went to Rosaria’s house. She lives on a street we walked two nights ago on our evening walking tour of Taormina. 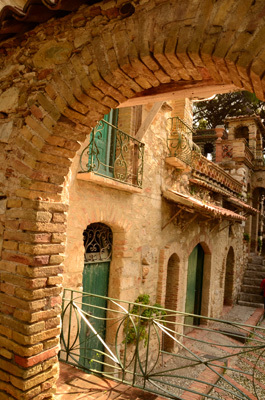 I didn’t pay much attention to the buildings on the street when we walked it, nor could I have imagined the beautiful home hidden behind the stone walls. Our simply-made fare was delicious. Rosaria made swordfish with pistachios (recall that was one of the dishes we made with the Duchess?) but this version was simpler to make and the ingredients looked like something we can duplicate in San Juan: thinner cutlets of swordfish, baked about 10 minutes, with a crust of pistachios. She also concocted a delicious salad of tomatoes with fresh basil and oregano from her garden pots. There were involtini, too, and bread, tuna, and escarole with tomatoes and garlic. Sicilian cannoli and almond cookies were our dessert. Magnifico! We enjoyed the company at dinner of Rosaria’s children, Gaia and Massimo. Both charming and interesting, it was fun to meet and talk to some Sicilian teenagers. I will look forward to a day when this family (including father, Andrea, who was off in Rome for a few days) comes to visit us in Wisconsin and Puerto Rico. We had such a good time that I was awake for hours reliving the dinner and the conversation. Well, it is finally here; our last day. Our final itinerary was to take us to Catania, to the fish market and to have lunch in a restaurant there. But, we found out from the hotel staff the night before, leaving a car loaded with luggage anywhere near the fish market would not be a good idea. So instead we opt for driving to Catania late morning, so that Jon and Galina can drop Gerry and me at the airport, thereby relieving the car of half its luggage load making the other half easily concealable under the rear flap. 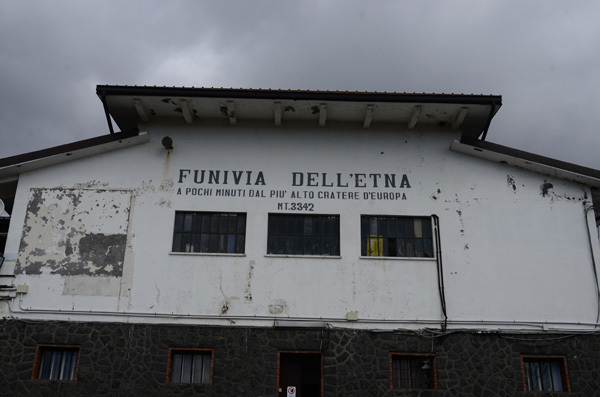 They will continue to Catania and the fish market and the restaurant without us, as they have almost the entire day before their 8:45pm flight to London. Looking at the theater as we walked down the mountain. We instead, will be hopping aboard a plane at about 3:15 to make our way back to Berlin, from where we leave the next day to fly home to Puerto Rico. 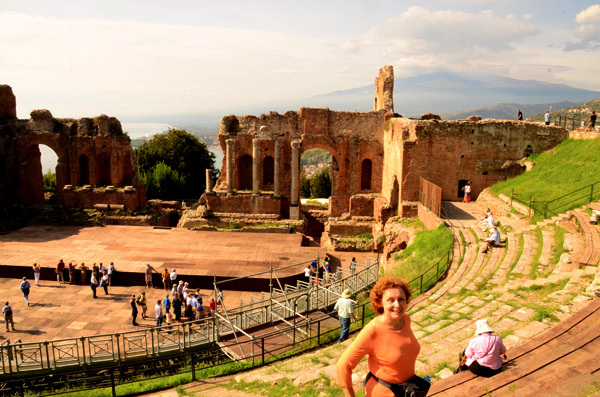 That does give Galina and me a couple of hours to visit the Community Gardens in Taormina and the Greek-Roman theater. We walked down the big stairs again (a car is out of the question). The gardens are lovely, with wonderful views of the water. 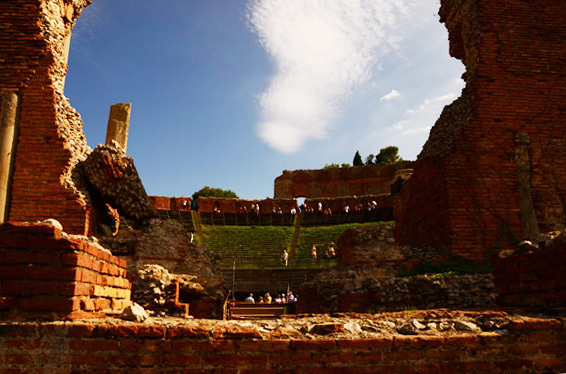 They were built by a Scottish woman who was invited to leave England after a scandalous affair with Edward II. There is restoration work underway to repair a couple of crumbling structures, but there is no doubt that this is a gem. It is an easy walk from the gardens to the theater. Easy, but crowded with tourists and tourist stalls selling all kinds of souvenirs – just not the T-shirt we wanted for Oscar. The theater (originally Greek and then rebuilt later by the Romans) is impressive. 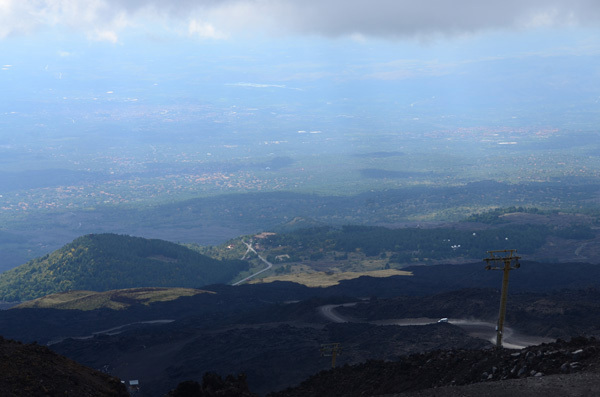 The ruined stage now shares Etna and the Mediterranean in its backdrop. The place is still in use today: There are plywood platforms for musicians, players and audience alike. It must be a wonderful experience to see a concert or performance here. It is so suggestive! On the way back to the hotel, we do a bit of last minute shopping – little goodies for taking home. Then we hail a cab, and now it is really over. 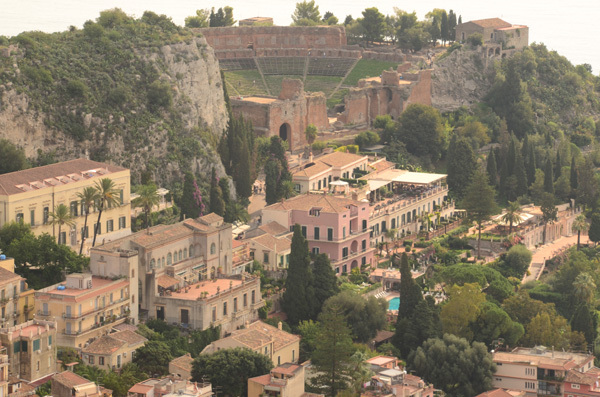 Though I am sad to be saying goodbye to Sicily, I have plans to return again someday and even spend a little more time. I have no regrets about this trip – I got to do everything that I wanted to, I bought remembrances that will conjure up the memories I have made, I have made new friends. I have renewed my fascination with the Italian language and with Italians. I have left nothing undone that I won’t be back to enjoy again. Arrivederci, Sicilia!